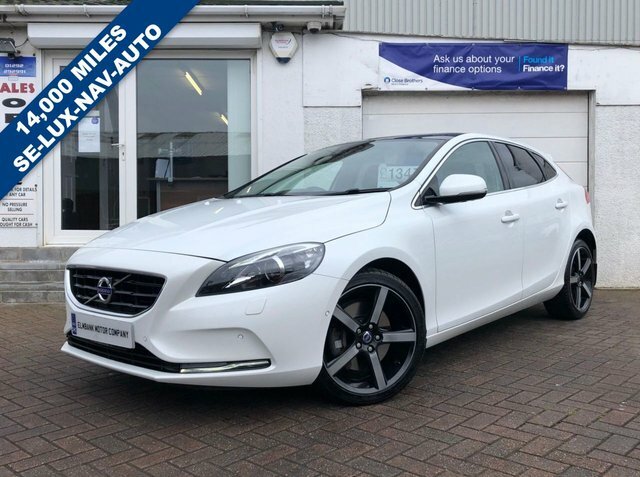 2015 15 VOLVO V40 2.0 D4 SE LUX NAV AUTOMATIC. A VERY WELL PRESENTED CAR ON OFFER, LOVELY CONDITION INSIDE AND OUT AND PERFECT FOR THE DRIVERS CAR, BEING FULLY AUTOMATIC AND HAS THE TRUSTED 2.0 D4 ENGINE. ON BOARD SPECIFICATION INCLUDES, FULL LEATHER INTERIOR, FRONT HEATED SEATS, GLASS PANORAMIC ROOF, REVERSE CAMERA, FRONT AND REAR PARKING SENSORS, ON BOARD COMPUTER AND IS ONLY £20 PER YEAR TO TAX. WE WELCOME ANY AA OR RAC INSPECTION AND CAN OFFER BESPOKE FINANCE PACKAGES. TO ARRANGE A VIEWING OR TEST DRIVE PLEASE CALL ELMBANK MOTOR COMPANY AYR ON 01292 292991.